The OzzMaker Raspberry Pi B+ and Pi 2 case consists of 6 Acrylic pieces. No screws are necessary to build this case. When inserting or removing the side pieces from the end pieces, please make sure to squeeze the clips in fully or you risk snapping the acrylic. 1)Place the two sides into the end piece with the holes for the Ethernet and USB. Reference your Raspberry Pi B+ to confirm that you have them in the correct orientation. 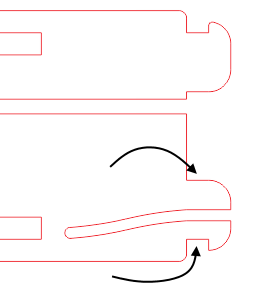 When inserting side pieces, insert the top part first and then squeeze together the clip at the bottom before inserting. 2)Add both top and bottom pieces, the top piece can face any direction. Insert your Raspberry Pi B+. 3)Add the remaining end piece. Make sure to squeeze the clips in fulling on both end pieces.